What do you get when you combine a design based on the geometric principles of the Pythagorean theorem, distinctive packaging, and a 100+ year track record? Tinkertoys! The construction set featuring wooden spools and rods was invented in the early 1900s by Charles Pajeau of Evanston, Illinois (a suburb of Chicago). 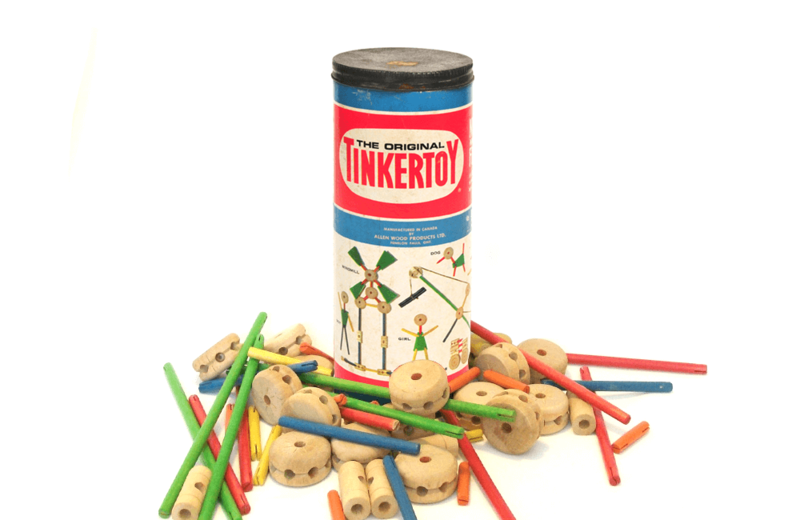 Historical accounts say that Pajeau’s inspiration for Tinkertoys came from watching children build objects with pencils, sticks, and empty spools of thread. A stonemason by trade, Pajeau built a playset that incorporated these shapes. The set’s spools each had eight holes drilled every 45 degrees around the perimeter and one hole in the middle. They could be connected using wooden sticks of different sizes. Regardless of their size, each stick in the set was cut to a correct length to form 90-degree triangles – a practical application of the Pythagorean theorem that served to fortify the structures that kids built. Like many toys that end up being hits, Tinkertoys got off to a slow start. Recognizing the need for more business acumen, Pajeau partnered with Robert Petit, a stockbroker, and formed The Toy Tinkers of Evanston. The duo’s first foray at the New York Toy Fair was met with limited interest. Undaunted, Pajeau struck deals with various shop owners to promote the construction sets through elaborate window displays. His moxie eventually paid off, with sales of the sets topping one million in the first year of production. 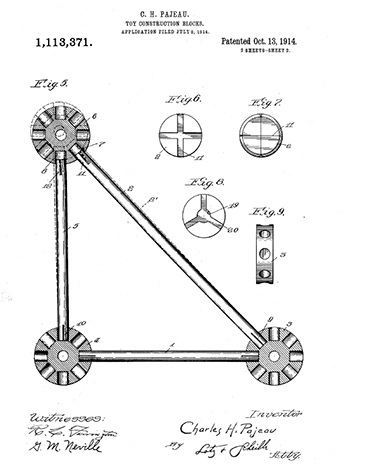 United States Patent #1,113,371, filed July 8, 1914 on behalf of Charles Pajeau, illustrates the initial design of his “Toy Construction Blocks.” Two components made up the design: spools, each with eight holes drilled around the edges and one in the middle; and rods, used to connect spools together to build objects of varying shapes and sizes. One of Tinkertoy’s most distinctive features is the toy’s packaging. Initially, the mailing tube design was chosen to reduce shipping costs. Early versions of the packaging included an address label on the tube with space for postage. 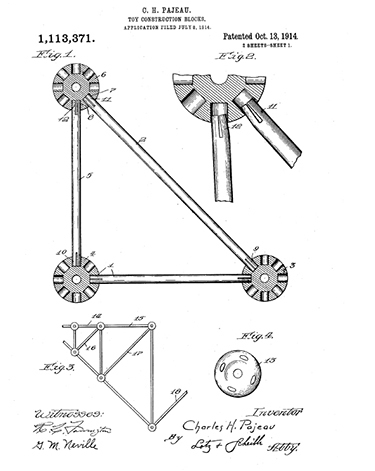 Like other construction toys of the day, such as Lincoln Logs and Erector Sets, Tinkertoys sets began to appear on the market with a varying number of pieces. In some sets, the spools and sticks were augmented with an electrical engine, which allowed the toy to appeal to a slightly older, pre-engineering crowd. To assist consumers in differentiating between the various offerings, sets were placed in mail tube packages of different sizes and also delineated with a number (ex: 116, 136) and a name (ex: major, prep, big boy, junior, grad). A colorful “how-to” instruction guide accompanied each set. In the 1950s, color was added and the wooden sticks appeared in red, green, blue, and yellow. Tinkertoys continue to be sold today. After passing from company to company through various mergers and acquisitions, the license to produce the toy landed with Hasbro and was sold through its Playskool division. In recognition of this toy’s longevity, play value, and creative inspiration of generations of children, Tinkertoys were inducted into the National Toy Hall of Fame in 1998.